Champion race horses breed champion race horses. Breed the best to the best and hope for the best. These two long accepted theories on Thoroughbred breeding have held sway for breeders since the dawn of the breed. There have been many horses who have achieved the pinnacle of success in both racing and breeding. In the past one hundred years Bold Ruler became the standard by which all are compared. Bold Ruler was a fantastic race horse. He won top level stakes races in each of his three years on the track. He became the preeminent sire of his generation, capturing eight leading sire championships, and has founded one of the more enduring sire lines in existence today. Bold Ruler was royally bred and not only lived up to his breeding potential, but enhance his pedigree further with his stud accomplishments. The pedigree of Bold Ruler is full of class and vigor. His sire was the ground breaking Nasrullah. Imported to Kentucky from Ireland by “Bull” Hancock to his Claiborne Farm, Nasrullah became a dynastic sire in North American breeding. Nasrullah had stood for six seasons in Ireland, and would stand in the US for another nine seasons before his untimely death of a heart attack in 1959. He left a plethora of great colts and fillies who became exceptional progenitors in advancing the breed. Miss Disco is the dam of Bold Ruler. She was a very durable stakes winner, and full sister to Metropolitan Handicap winner Loser Weeper, sired by the 1935 US horse of the year Discovery. “Bull” Hancock purchased Miss Disco in 1950 while she was in foal to Rosemont. He made the purchase for his own broodmare colony but during the sale he had missed out on another mare he was trying to acquire for Gladys Phipps, the elegant owner of the successful Wheatley Stable. Hancock felt obligated to offer Miss Disco to his client and friend. Mrs. Phipps bought Miss Disco from Hancock, after she heard from him about the mare’s potential. Hancock felt the mare would be a good mate for Nasrullah. Miss Disco bore a filly by Rosemont in 1951, named Hill Rose who later produced multi stakes winner True North, and then was bred for four consecutive years to Nasrullah. The third foal from this partnership was Bold Ruler. Bold Ruler is full of generational American breeding on his dam side and top European breeding on his sire side. He was the perfect blend of stoutness and durability coming from his mother and speed and brilliance coming from his father. Bold Ruler came into the world on April 6, 1954, which is also the same night that another thoroughbred legend Round Table was born. Both of these greats were foaled within minutes of each other at Claiborne Farm. They would be linked together for the rest of their lives. Having a great pedigree is important. Having great connections is paramount to a young horse’s success. Bold Ruler had the benefit of being a Wheatley Stable home bred and thus was given to the care of one of the greatest trainers in history. James “Sunny Jim” Fitzsimmons was the long tenured trainer for the Wheatley horses. He was near the end of his long and distinguished career by the time the dark bay son of Nasrullah – Miss Disco entered his barn. The stable staff referred to the legendary trainer as “Mr. Fitz”. Mr. Fitz had already trained the impeccable champion Nashua, a son of Nasrullah, and was looking forward to training this new youngster of the great sire. The new colt was showing great promise as he learned his racing craft. Bold Ruler was a robust and very intelligent young steed. Mr. Fitz had him ready to impress for his first start, which came on April 9, 1956 at the now long gone Jamaica race track in New York. Bold Ruler won the five furlong race by three and one half lengths in a good 1:00 2/5 time. Bold Ruler proceeded to win his next four starts, all at the five furlong distance. Each race was faster than the previous race. The win streak included the Youthful Stakes and the Juvenile Stakes, the latter was run in 56 seconds flat. Sunny Jim let down his burgeoning star for a bit of a breather before his sixth race, a three month duration which included the premier Saratoga meet. Bold Ruler had also hurt his back in the Juvenile Stakes and had developed a sore hock. The injuries were not serious, but they were a harbinger of niggling things to come for him. The Belmont track came up sloppy for a six furlong allowance race when Bold Ruler re-appeared to the races. He finished second to Nashville, another son of Nasrullah. Bold Ruler had a penchant for getting himself into sticky situations. He had slammed his head in the starting stalls before the race and came back to the paddock with a bloody mouth. The son of Nasrullah redeemed himself two weeks later at Belmont with a 1:08 3/5 win at six furlongs. By this time Eddie Arcaro had become the regular rider of Bold Ruler, adding another top flight connection to the colt’s support team. The lucrative Futurity Stakes was Bold Ruler’s next race, which he won by two and one half lengths. The race was on the same Belmont card as the Jockey Club Gold Cup, which saw Nashua end his brilliant career in winning style. It was noticed by the racing press at the time that the Nasrullah torch had been ceremoniously passed from the now retiring Nashua to the up and coming Bold Ruler. However Bold Ruler was to encounter trouble in the very rich Garden State Stakes. A field of nineteen juveniles entered the gate for the one and one-sixteenth mile race. Jaunty John would tear off a first half mile in 45 3/5, after which he suddenly slowed down causing Bold Ruler to clip heels with the now exhausted former race leader. Bold Ruler almost fell in the incident and never recovered his momentum. He finished twenty-four lengths behind race winner Barbizon. Unscathed, Bold Ruler entered in the Remsen Stakes at Jamaica one week later. Arcaro was back aboard, he had served another of his many suspensions during the Garden State Stakes race. Bold Ruler ran a dismal race, finishing last in the eleven horse field. The last two races would take Bold Ruler out of the top spot in the voting for champion two year old honours. Barbizon was named champion two year old. Fitzsimmons brought Bold Ruler and the rest of his charges to Florida for the winter. He set about preparing Bold Ruler for the upcoming classics in the spring. His challenge was to harness the great speed of Bold Ruler to go farther than the sprint distances he had been so dominant in. This was no easy task as Bold Ruler had some of his sire’s obstinacy in his personality. However by having as his dam Miss Disco, thus a cross from the great weight carrying champion Discovery in his pedigree, Mr. Fitz had encouragement toward the ability of his young three year old star to perhaps get the longer distances required to win the big races ahead. Not to say that Bold Ruler was a head case, he was very intelligent and was very trainable. He could be a handful for many though, with the exception of Mrs. Phipps. When she was present, Bold Ruler was as docile as a little lamb. Mrs. Phipps absolutely loved Bold Ruler, and it was apparent that the horse returned the affection. Bold Ruler won the seven furlong Bahamas Stakes on January 30, beating the highly regarded Gen. Duke by four and one half lengths. Seventeen days later he finished second by a head to Gen. Duke in the nine furlong Everglades Stakes, with Iron Liege behind in third. In both races, Bold Ruler was conceding twelve pounds to Gen. Duke and seven pounds to Iron Liege in the Everglades. Two weeks later for his third successive start at Hialeah, Bold Ruler defeated both of these rivals in the nine furlong Flamingo Stakes at level weights. The improving Gen. Duke turned the tables in the Florida Derby at Gulfstream Park beating Bold Ruler by one and a half lengths, Iron Liege was third. Two weeks prior to the Kentucky Derby, Bold Ruler nosed out Gallant Man to win the Wood Memorial at Jamaica. The stage was now set for a highly anticipated Kentucky Derby. Gen. Duke had unfortunately gone by the wayside with injury, but there was still Gallant Man, Iron Liege, Federal Hill, Mister Jive, Better Bee and the colt born the same night as Bold Ruler, Round Table to contend the race. This would be one the all time best fields in Derby history. Bold Ruler decided on this day to ignore the rating tactics he had learned and fought Arcaro’s instructions. Federal Hill set a quick pace while Bold Ruler in behind was using up his energy in his dispute with his pilot. By the time the field came to the home stretch, Bold Ruler in third place was exhausted and finished fourth behind Iron Liege, Gallant Man and Round Table. Mr. Fitz then started Bold Ruler in a three horse exhibition race just five days before the Preakness Stakes. The race was an eight and one half furlong affair over the Pimlico track. Bold Ruler won by a length, wearing blinkers for the first time. It was a good tune up for the second leg of the Triple Crown. There were only seven horses to contest the Preakness Stakes in 1957. Iron Liege was in but Gallant Man and Round Table were not. John Nerud, the trainer of Gallant Man had decided to prepare his charge for the Belmont Stakes while Round Table under the care of Bill Molter returned to California and embarked on a wonderful run of success. Iron Liege was a slight favourite over Bold Ruler in the betting. Bold Ruler set the pace with Federal Hill in close pursuit. By the six furlong mark, Federal Hill had had enough and Iron Liege would inherit second position. With three sixteenths to go, after Bold Ruler had cut a 1:36 3/5 mile, Iron Liege made his bid. Bold Ruler responded with a determined effort to draw away by two lengths and hold the advantage to the finish line. Bold Ruler had given Mrs. Phipps her first classic winner. This great first lady of the turf enthusiastically supported the sport for three decades up to this point, and was deeply thrilled with Bold Ruler’s win. Four weeks later, Bold Ruler was in the starting gate for the twelve furlong Belmont Stakes. Despite his connections trepidation toward Bold Ruler’s distance limitations, Mrs. Phipps and Mr. Fitz were not ones to duck a challenge. They were in it for the love of the sport and the love of the horse. Only five other colts started alongside Bold Ruler for the Belmont. One of the challengers was a refreshed Gallant Man. A rabbit was entered by Nerud in the form of the speedy Bold Nero. The latter’s job was to exhaust Bold Ruler who would likely set the pace, thus setting up Gallant Man to assume command with his patented stretch run. The plan worked to perfection as Gallant Man charged down the Belmont home stretch to win by eight lengths over Inside Tract, who in turn was four lengths in front of an exhausted Bold Ruler. Fitzsimmons gave Bold Ruler a deserved rest. The colt was always suffering from minor ailments, nothing serious which would curtail his racing, but bothersome niggles that hampered his well being. As a foal, Bold Ruler had a lingering hernia problem, he suffered with a very sensitive mouth as a result from damaging his tongue from an unseen accident as a yearling and he suffered from chronic arthritis in his back. The wily Sunny Jim devised unique methods to help Bold Ruler overcome these troubles. Mr. Fitz knew his young charge was an exceptional athlete. The rest served Bold Ruler well. He made seven more starts in his three year old season, winning six and finishing third in one. An allowance handicap of six furlongs at Belmont on September 9 was Bold Ruler’s re-emergence to racing. He won this by a five length margin and then took the one mile Jerome Handicap over a sloppy Belmont by six lengths. Dedicate and Gallant Man beat him to the finish line in the ten furlong Woodward Stakes two weeks later. Bold Ruler then returned to the winner’s circle in the seven furlong Vosburgh Handicap. At the Jamaica race track, Bold Ruler won the Queen’s County carrying 130 lbs, and moved on to Garden State Park to win the nine and a half furlong Ben Franklin Handicap carrying 136 lbs. The Trenton Handicap was next and Bold Ruler completed his three year old season with a two length score in this ten furlong race, defeating Gallant Man and Round Table. Before the advent of the Eclipse Awards, various polls were conducted to assess and honour the top Thoroughbreds in each division. Bold Ruler on the basis of his excellent year won two of the three major polls for horse of the year. His eleven wins from sixteen starts, against the best in an obviously talented division, were deemed as the superior record for the year. Back for a winter in Florida, Mr. Fitz prepared Bold Ruler for another campaign. The niggling troubles would resurface, but a little more serious than before. Bold Ruler popped a splint in January, taking him out of training until he healed. Then he wrenched his ankle in February and developed bursitis. One thing after another derailed his chances to run under the Florida sunshine. He eventually made it back to the races, but not until May 17 at Belmont. Bold Ruler had a very good four year old campaign but was not a champion. Round Table came into top form and claimed the Horse of the Year and divisional title from his buddy. Bold Ruler won five of seven races never carrying less than 133 lbs. He won the Suburban and Monmouth Handicaps of ten furlongs each. Bold Ruler also captured the six furlong Toboggan, seven furlong Carter, and nine furlong Stymie Handicaps. He finished second to Gallant Man in the one mile Metropolitan and ended his career with a seventh place, some fifteen lengths back of Cohoes in the Brooklyn Handicap. Following the Brooklyn loss, Bold Ruler’s bursitis flared up in his left front ankle. The decision to stop his training and retire Bold Ruler to stud was made. He had done enough and deserved his retirement. Claiborne Farm, his birth place, would be his home from now on. The royally bred champion was now to embark on a career that in the opinions of many exceeded his track accomplishments. As a son of Nasrullah from a Discovery mare, and with a world class race record in the books, Bold Ruler was highly regarded as a sire prospect. He did not disappoint. Bold Ruler claimed his first sire championship in 1963, with only two crops old enough to race. From his first crop of foals came champion three year old filly Lamp Chop, stakes winners Bold Consort, Ornamento, and Speedwell. The latter was a three quarter sister to Bold Ruler’s greatest son Secretariat, born a decade later. Bold Ruler sired a steady stream of champions and major stakes winners. His 1963 leading sire title was the first of seven consecutive titles. This unprecedented run of success put an exclamation point on his growing reputation as the premier sire in breeding. Bold Ruler is the sire of the following champions: Gamely, Successor, Bold Lad (USA) and Bold Lad (IRE), Queen Empress, Bold Bidder, Vitriolic, Queen of the Stage, Wajima and of course Secretariat. Secretariat became a living legend and the most recognisable horse to racing fans both casual and enthusiastic alike. “Big Red” changed a perceived notion toward Bold Ruler’s get when he won his Triple Crown. Bold Ruler was developing a reputation as a great sire of precocious two year olds and of great sprinters and milers, but not horses that could carry their speed to the classic distances. There was some validity to this, but when one looks at the entire output of Bold Ruler’s sire record, we can see many exceptions. Bold Bidder was a very good late developing handicap champion. He would also become one of the best sons of Bold Ruler at stud. Among his get are Kentucky Derby winners Cannonade and the sensational Spectacular Bid. Bold Ruler sired other sons who when sent to stud sired classic winners. Bold Commander sired Derby winner Dust Commander. What A Pleasure sired champion two year old and Kentucky Derby winner Foolish Pleasure. Irish Castle sired Derby and Belmont winner Bold Forbes. Secretariat sired Preakness and Belmont winner Risen Star, while Raja Baba became a leading sire in his own right in 1980. 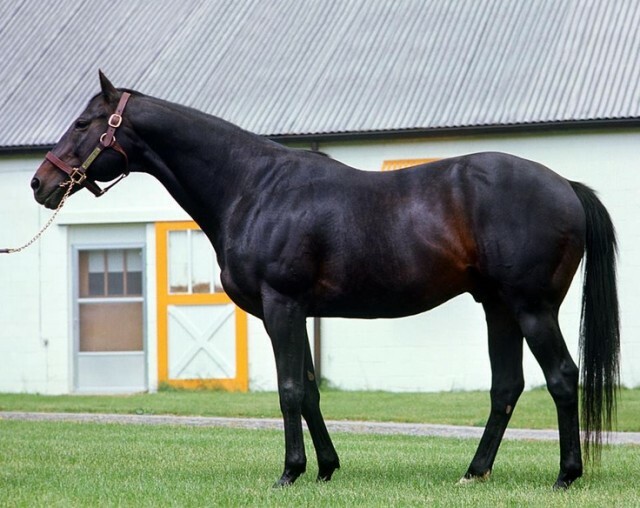 Five of the ten Kentucky Derbies in the 1970’s were won by sons sired by Bold Ruler sons. One Derby was won by a great grand son and one by his own son. That makes it seven of ten Kentucky Derby victories by direct tail male descendants of Bold Ruler in one decade. Two of the three Triple Crown winners in the 1970’s were tail male descendants of Bold Ruler. Two lesser known sons of Bold Ruler also became very influential sires. Santa Anita Derby winner Boldnesian was the sire of leading Canadian sire Bold Ruckus and Jersey Derby winner Bold Reasoning. The latter sired 1977 Triple Crown winner Seattle Slew before his untimely early death at the age of nine. This is the tail male line which has persevered in high regard to the present day, especially through Seattle Slew’s son A.P. Indy, and on to the current sensational sire Tapit. The other lesser known son of Bold Ruler to achieve sire importance was Reviewer. Although somewhat brittle, Reviewer won nine of thirteen races including six stakes races. He died at the age of eleven following a paddock accident in which he irreparably broke his left hind leg. Before he left us he would sire Revidere, the champion three year old filly in 1974, and then in his following crop sired the incomparable Ruffian. All who follow Thoroughbred racing know of her tragic demise from a multiple leg fracture sustained in a match race with Foolish Pleasure, so I will dispense with the details of such a great loss. The demand for Bold Ruler stock increased, becoming almost an obsession for many. Not many of his get would come to the yearling sales. Breeders lucky enough to obtain a breeding season were reluctant to part with his offspring. His sons were becoming excellent sires, while his daughters were proving to be excellent producers. The list of stakes winners and or stakes sires also include Dewan, King Emperor, Blade, Bold Hour, Key To The Kingdom, Plum Bold, and Chieftan. Bold Ruler is also the broodmare sire of such good stakes winners as Autobiography, Targowice, Avowal, Sensational, Christmas Past, Seraphic, Upper Case, Intrepid Hero, and Private Terms. Ogden Phipps, son of Gladys Phipps, had become the chief steward for Bold Ruler’s stud career. He would institute foal sharing arrangements with breeders between himself and the mare owners. This symbiotic relationship was a clever way for Phipps to obtain entry into some excellent breeding families and for the other breeders to acquire the blood of Bold Ruler for their own breeding stock. One result of this scheme famously led to the breeding of Secretariat. When all was said and done, Bold Ruler sired eighty-two stakes winners from three hundred and fifty-six named foals for a phenomenal 23% strike rate. He won eight sire titles, and is at the forefront of a thriving sire line. He was the broodmare sire of one hundred and nineteen stakes winners. These are incredible numbers given the fact that Bold Ruler never had more than thirty-five foals in any of his thirteen crops. During the sixties and seventies, the Bold Ruler tail male line held supreme. By the eighties the Northern Dancer and Mr. Prospector lines began to surpass in classic and grade one wins. The sons of Bold Ruler, while very good at stud, were not consistent in getting heirs to the line. Bold Ruler looked very much like his sire in colour and conformation. He inherited the mantle from Nasrullah and expanded on the achievements of the line. As the sire of the immortal Secretariat, he achieved the pinnacle of any sire. However by the time of Secretariat’s brilliance was on display, Bold Ruler had passed away. The great sire had cancer. A biopsy of a timorous mass deep in the nasal passage tested malignant in August of 1970. Colbalt treatments were prescribed, a first for an equine. Bold Ruler seemed to be responding to the treatments, which were administered in six day intervals for two months. A week after Bold Ruler returned to Claiborne from his treatments, Mrs. Phipps passed away. Bold Ruler became well enough for the next breeding season and resumed his trade, but the cancer would return in June of 1971. He was losing weight at an alarming rate. A biopsy on June 2 confirmed that the malignant tumour had returned. Furthermore, the malignancy produced lesions in his head, neck and chest. Bold Ruler was fading, and fading fast. On June 12, 1971, the great Bold Ruler was humanly euthanized. He was seventeen. A great race horse and a great sire, Bold Ruler dominated North American breeding like no other stallion. His influence is still strong today, more than forty years after his passing. He overcame injuries to demonstrate his courage and exceptional talent on the track. He lived up to his regal breeding and passed his gifts on to future generations. He ruled the leading sire lists like no other before or since his time. Bold Ruler was a gift from the racing gods for which everyone who loves Thoroughbreds are grateful. I enjoyed your comments. Yes, it was terrible to put Ruffian in that match race. I will never forget it and the horror I felt when she broke down. Thanks for sharing. Racing, schmacing. He was also the grand sire of Thoroughbred Sport Horses like mine. Racing lasts a few years, but all over this country an army of riders have partnered wonderfully with Bold Ruler descendants for decades. I had 18 years with my guy, may he R.I.P. I had a rescue out of Bold Ruler taken from a kill pen. He was the sweetest and kindest horse I ever knew. Let him really run out on two occasions and it was like being in the eye of a hurricane. Will never forget that horse. I was the proud owner of a great-grandson of Bold Ruler. He looked very much like his great grandsire, having the same top line and exceptional deep chest. My boy also was highly intelligent and extremely courageous. I had to put him down this year just months short of his 22nd birthday. I miss him every day. I had the good fortune to purchase a Bold Ruler grandson when he was a slow two year old wintering in NH to “do some maturing.” What was originally going to be a project horse to transition to show hunters over the winter, for a quick sale the following summer turned into the equine love of my life. I saw judges actually smile when he would lift into his rocking canter, and roll his way over fences and under saddle. He was a true gentleman, and a Bold Ruler baby, through and through, keeping me company until the ripe old age of 28. Fitting that I saw this today, on what would have been his 32nd birthday. Thank you so much for sharing.